Grease (really well) a 9x9 baking pan. I like to use my stoneware for nice even baking. 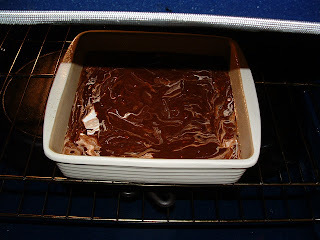 Melt butter and chopped unsweetened chocolate in a double boiler until smooth and consistent. Set aside to cool. Toss chocolate chip pieces and walnuts with a bit of the flour mixture and set aside. In a large mixing bowl beat the eggs and vanilla until smooth and consistent. Add cooled chocolate mixture into the eggs and blend well. By hand stir in the flour mixture just until well blended - DO NOT over mix! 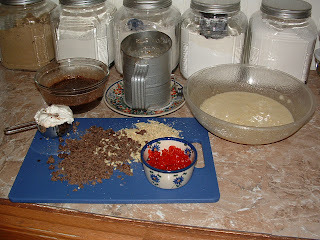 Fold in the chocolate pieces, cherry pieces and walnuts just until well blended. Warm the marshmallow cream for 15-20 seconds in the microwave (just enough to make it spreadable) and spread it over the chocolate batter in the mixing bowl. 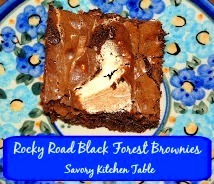 With a knife gently and slightly swirl it lightly into the chocolate batter. If you swirl too much it will just become part of the batter instead of clumps of marshmallow. 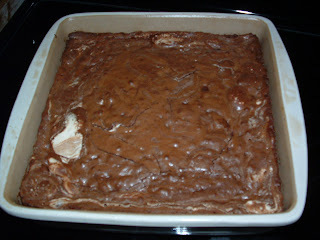 Gently pour the batter into the prepared ban and bake 40-45 minutes or until edges pull away from the sides of the pan. Cool the cake in the pan until completely cooled.